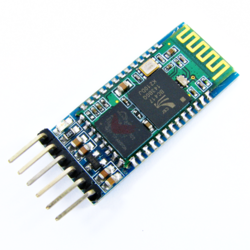 Abiding by the strict industrial norms and quality standards, we are engaged in supplying and trading Bluetooth Module. Our experts have designed and developed these modules by making use of latest technology as per the prevailing requirements of the industry. These blue tooth modules offers an option of slave and master mode to the user and are available in variety of specifications at most reasonable prices. The Bluetooth Module Breakout is the latest Bluetooth wireless serial cable! 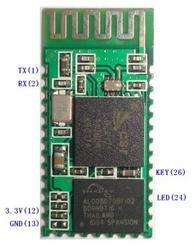 This version of the popular Bluetooth uses the HC-05/HC-06 module. These modems work as a serial (RX/TX) pipe. Any serial stream from 9600 to 115200bps can be passed seamlessly from your computer to your target. The remote unit can be powered from 3.3V up to 6V for easy battery attachment. All signal pins on the remote unit are 3V-6V tolerant. No level shifting is required. Do not attach this device directly to a serial port. 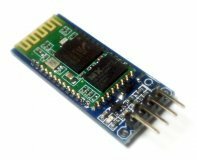 You will need an RS232 to TTL converter circuit or Arduio XBee USB Adapter if you need to attach this to a computer. You can either solder a 6-pin header or individual wires. And now, we provide HC-05/06, HC-05 could be setting to Master or Slave by user. HC-06 just be Master or Slave, that could be customized. This module default is HC-06 with Slave mode. 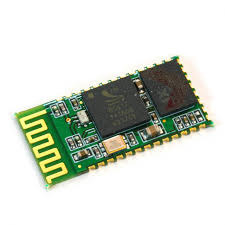 These small size Bluetooth TTL transceiver modules are designed for serial communication (SPP - serial port profile). It allows your target device to both send or receive TTL data via Bluetooth technology without connecting a serial cable to your computer. The modules with the HC-06 firmware are the modules which are factory set to be Master or Slave modules. Master and slave mode cannot be switched from the factory setting. HC-06 is a commercial grade product.